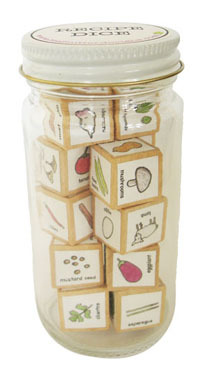 I spotted these yesterday on The Kitchn blog and thought it was a super creative gift for the creative cook! Help your decide what to cook for dinner. Or maybe your husband needs a bit of coaxing when it comes to grocery shopping. Heck, for anyone who likes a little extra thrill to their food, these are just the thing. AND they have a vegetarian set! 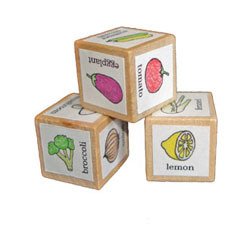 The wooden dice feature seasonal vegetables, grains, meats, spices, herbs, and a few additional ingredients like lemon, ginger and hot chiles.